The word evolution can mean different things depending on who is using the word. Evolution simply means a change over time. People often speak of the evolution of a certain model of car or how computer technology has evolved. 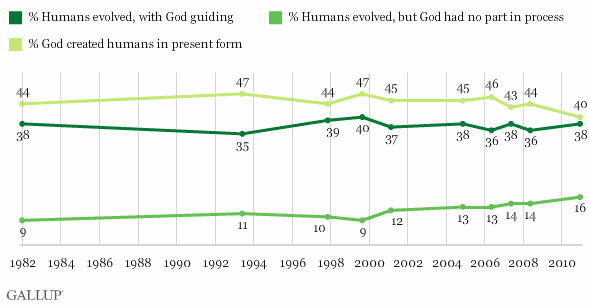 Most people think about the evolution in biology when they hear or use the term. When you discuss evolution it is important to understand the distinction between two different types of evolutionary. Micro-Evoluion where minor changes within a species (family group) occur, but do not give rise to new gene material. I call this type of evolution adaptions. We see this everyday within varieties of plants and animals such as dogs, frogs, garden vegetables, and trees for example. Macro-evolution is larger scale change from species (family group) to another species (family group) that is more complex and higher through mutation and natural selection. No one has ever witnessed this type of evolution before and this is the type of evolution that is claimed through Darwin’s theory. From this point forward, when you see the word Evolution, it will refer to Macro-Evolution. Evolution is a purely physical/naturalistic explanation to the origin of life on earth and of all matter in the known universe. Charles Darwin has been known as the Father of evolution, but he wasn’t the first to contemplate a purely physical origin, during the fourth and fifth centuries some Greek philosophers like Thales, Leucippus, and Democritus had detailed explanations of how the universe came together through random forces rather than by design. 2 Darwin also had a partner, Alfred Wallace, who worked with Darwin on the theory of evolution, but Wallace began to doubt it was adequate to explain obvious features of the human race. You don’t hear much of Wallace and His disagreement with Darwin now. About 30 years ago the theory of Evolution begin to be looked at more closely by public and private school systems because of the rise of Christian apologists in the mid-century that began to challenge the views of Evolution. Parents and school boards had Evolution taken out of school textbooks or demanded that other textbooks that taught other ideas like Intelligent Design as equally as Evolution to be used. This seem to waken those who supported Evolution like Dawkins, Hawking, Dennett, and Harris, to push back even harder with newer evidences and proofs with the new advancements that science was making recently. Many of these newer evidences are published in scientific journals, books, web blogs and are used by many highschool and university teacher to continually bombard students through indoctrination. Most of the scientific claims today that are labeled “support for Evolution” are speculative at best, leaving the majority of the proof on assumptions and premises. They are lean on supporting facts and rely on your presuppositions and how you interpret the data. I can back up that last thought with the evidence that despite all this “new” evidence for Evolution the debate still wages on. The case had not been closed in the slightest. Open-minded intelligent theists are not abandoning their beliefs in support of evolution. You can reference this in the Gallop chart. The New Atheists have been on the offense as of late to attempt to snuff out any religious beliefs by Christians. Their words towards religious beliefs have been harsh. Richard Dawkins has even had a college circuit speaking tour where has offered a debaptizing ceremony for those who wish to renounce their faith in God. 3 The boldness at which these new claims are being made by those who support Evolution is very high. It reminds me of the axiom, that “the bigger and more important the lie, often the greater the enthusiasm of which it must be sold with.” Not to worry though, because there are a new group of well-educated Christians in both the field of science and philosophy that have risen to the challenge by the New Atheists. Over the next few posts I will examine Evolution and break down the processes and talking points that many supporters of Evolution use to champion their beliefs. Evolution must account for three “Big Bangs;” the origin of matter, the origin or life, and the origin of our consciences. We will also look at the processes like genetic drift, gene flow, mutation, non-random mating, as well as natural selection. If you don’t understand those words, don’t worry I will explain them to you one at a time in future posts. If you support evolution and have something you want me to look at please leave a comment here and I will add it to the list of topics of discussions with Evolution. I will do my best to give you an accurate view of Evolution, I don’t want to try to make any red-herrings out of the other side of the argument. As always your questions, comments, and discussions are welcomed. 3 – Marrow, Jonathan; McDowell, Sean – Is God Just A Human Invention? This entry was posted on Wednesday, March 21st, 2012 at 10:56 pm and is filed under Definitions, evolution, science. You can follow any responses to this entry through the RSS 2.0 feed. You can leave a response, or trackback from your own site.